Eric Carle's artwork for the cover of second edition of The Very Hungry Caterpillar, published in 1987. Source. A Very Hungry Caterpillar is childrens author Eric Carle’s most well known book— it's been translated into over fifty languages! 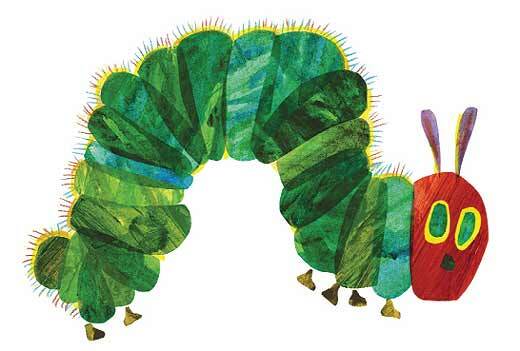 The book follows a caterpillar’s life as he eats, goes through metamorphosis, and emerges a beautiful butterfly. A buzzing bee may be a nuisance and remind you of a traumatizing sting, but to Carle, it can be inspiration for a new creature and story. Many of the characters in Carle’s books were inspired by nature from when he was a young boy exploring castles in Germany. Eric Carle is well known for his distinct illustrations that accompany his stories. Using a collage technique with bright, colorful hand painted tissue paper, Carle’s illustrations have captured the attention and imagination of children for generations. Inspired by Carle’s work, Bemis School of Art is offering a spring break class for kids 7-10 years old called Colorful Carle Creatures. This class teaches kids how Carle made his creatures and gives them an opportunity to create their own animals and bugs using his distinct collage, painting, and drawing techniques. Monday-Friday, March 26-30 | 1-3 p.m.